ourselves on our service and care given to those who are bereaved in their time of need. death was expected. The next few days can be both confusing and busy for the family and this is when we can give you caring help and guidance when you most require it. As soon as you contact us we will take preliminary details but it is our policy not to impose any urgency on you so that you can make decisions without any undue pressure. With our experience and local knowledge, we are able to give the care and help you may require in a calm and professional manner. A funeral is a very personal event and we understand how important it is for each family to make sure it is as meaningful as possible for their particular circumstances. We have been a family business since we were established in 1962 and today we are Newquay and Perranporth's only independent N.A.F.D. member. As members of the National Association of Funeral Directors we have to adhere to a code of practice for your peace of mind. Always available in your time of need. 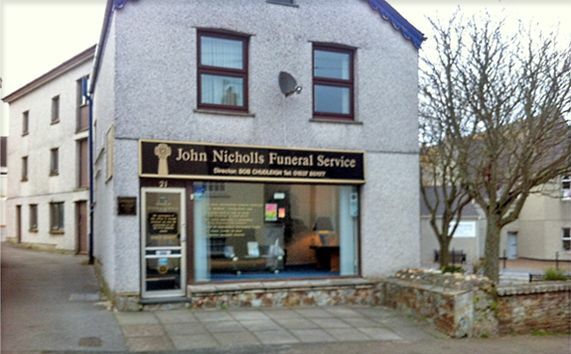 © John Nicholls Funeral Services.